Goneo Review 2019: Is Goneo a Good Hosting? German website hosting provider Goneo provides beginner-friendly tools such as a website builder and one-click installer, plus expert features including PHP 7 and support for advanced scripting languages. Founded in 2006, Goneo is a website hosting provider based in Germany. They provide shared website hosting and managed dedicated servers. Their servers use SSD and they have built their own website building tool. They host approximately 15,000 websites for customers in Germany, Austria, Japan, and Spain. Their website is in German, but support is also available in English. Goneo offers a simple selection of website hosting services. As well as their own in-house website builder, they offer four shared hosting packages, dedicated server rentals, and domain registration. Goneo offers several nice features for beginners. They have their own website builder that comes with readymade website templates and is designed to be used by people who have no coding experience. Although this does incur an additional cost, you can try the website builder free-of-charge for 30 days. They also have a one-click installer to install many popular programs including WordPress, Joomla, Drupal, OpenCart, Roundcube and many more. Goneo’s website hosting uses SSD (which is up to 30% faster than HDD) to operate MySQL databases faster. All of their plans benefit from free SSL certificates, unlimited bandwidth, and (in all but the base package) multiple domains. It’s refreshing to see these features included as standard without an additional monthly fee. For more advanced users, they support Python and PHP 7 (which is far faster than version 5 offered by many competitors). Unfortunately, Goneo does not offer an uptime guarantee. In fact, they don’t even advertise their average uptime, but a quick live chat with support assured me that their own measured uptime is 99.8 % (but previous third party testers have found them to have a 100% uptime average). Goneo’s nicely priced lowest package includes one domain, 20 GB of disk space, and a free SSL certificate. The other packages are relatively expensive when compared to both local and international competitors, but the prices do include lots of add-ons that could cost extra elsewhere. The hosting plans can be purchased either monthly or annually, paid upfront. Yearly plans are slightly cheaper than the monthly options, but what’s really incentivizing is their reductions for buying their higher priced plans. For example, you can get six months free by purchasing the highest priced plan. All plans come with a small setup cost, and it will cost you (a lot) more if you want your own accessible backups versions of your website. They do routinely backup your data for free, but only for disaster recovery reasons. Customer service is provided via telephone and email. They do not clearly advertise their customer service or technical support opening hours, but they have always responded right away with relevant information whenever I have contacted them at any time of day. You can also contact them via social media accounts such as Facebook and Twitter. Their knowledge base is very limited. Goneo is a relatively new website hosting provider that has already picked up an impressive number of clients thanks to their focus on quality and their provision of SSD drives, German servers, and PHP 7. 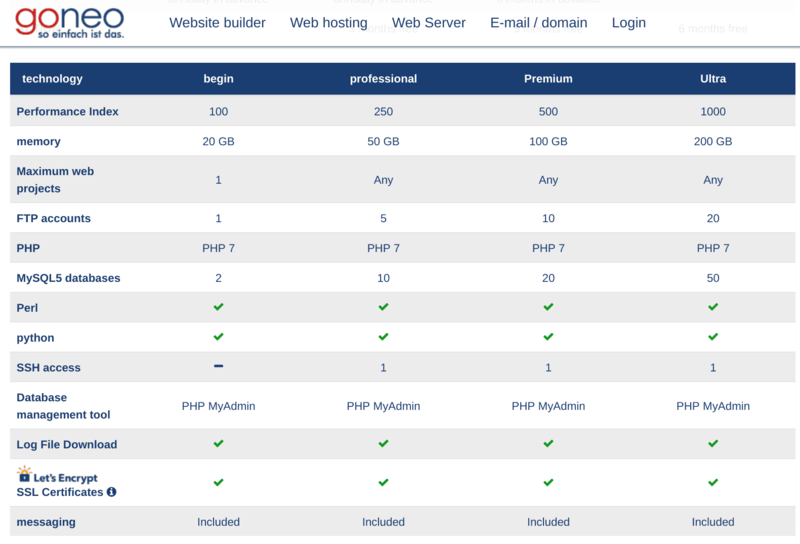 Wondering how Goneo stacks up against other Web Hosting companies? Enter any other Web Hosting company and we will give you a side-by-side comparison.